Plunge into our playoff season coverage, first with a look at the WFTDA. What's going to happen with such a tired old rule set in play? For Part 2 of WRDN’s roller derby tournament season preview, the 2012 USARS Regionals, click here. This month marks the beginning of the WFTDA Playoffs (neé The Big 5), where 40 qualifying teams from the four WFTDA regions all take their shot at advancing to the Championships in Atlanta this November. Normally, this is something I’d be very, very enthusiastic about. However, the run up to this year’s playoff season, to me at least, feels different than the weeks preceding last year’s tournament run. That’s because there are a great deal of unknowns facing the run to the Hydra this year. The biggest reason for that is because the new WFTDA rules update that was supposed to be released in May of this year … was not. Instead, they were delayed, to be released (likely) this November and to go into effect in January, well after this year’s playoffs are over and done with. This of course means the playoff games played over the next several weeks will be done so under the rusty 2010 ruleset that began to pop rivets at ECDX 2011, finally cracking open during the west region playoffs last year when That Game happened. Later on we discovered that the there can be no-packs just as often as yes-packs, penalties were being committed at record rates, jammerless jams are still completely possible, and doing “whatever it takes to win” apparently includes taking numerous intentional penalties at the end of a game to guarantee victory. So that this kind of non-skating, non-derby stuff can happen again during this year’s playoffs—potentially with a higher frequency now that teams understand why it is effective and know it may help them win—isn’t exactly getting my derby juices flowing as hard as last year, or (especially) the year before that. Still, the optimist in me wants to be hopeful, and there are signs that despite everything there will be a lot of great games, and great stories to come from them. There’s also the underdog story of Wasatch, who charged up the regional rankings from 15th to 9th in just a few months to make the playoffs and become sentimental favorites this year. There’s Montreal, who surprised everyone (including themselves, I would imagine) with a top-3 seed in the East. Oly and Rocky Mountain, two teams guaranteed to play in a barn-burner whenever they meet, will almost certainly be setting barns ablaze when they open playoff action against each other. And watch out for the entire North Central region—as Arch Rival’s 115-99 upset over Naptown is any indication, North Centrals may become the new ‘Nationals before long. A mix of strong positives and strong negatives should be expected this WFTDA derby playoff season. But putting aside the fun stories, great games and crappy non-derby activities, the fact that there are many changes to team rosters from last year (or even from last month, ahem) means there are fewer sure-fire lead-pipe lock victories you can rely on for your WFTDA Bracket Bonanza entry this year. Good luck filling these things out with any semblance of accuracy this year. But those question are secondary to the two biggest unknowns facing the WFTDA itself. This of course means viewers cannot watch live for free, in any way, shape, or form. For most people, this won’t be too much of an issue. Most were likely planning to pay for the live HD stream anyway, which is about 40% cheaper over last year. Good news there, and even better news for the watch partiers who will have to chip in even less per head to see some of the best games they’ll see all year. But for everyone else who relied on last year’s live SD feed—even if viewership was capped and the quality wasn’t always adequate—tough cookies. At least they can skip the crappy games and huge blowouts, and go directly to the good stuff … whenever the archives get posted, some time after they’ve had the results spoiled. Also remember, there was the issue last year of many paid HD streams crapping out. I’m wondering if the decision to shut out the free low-def stream is directly related to that, to make sure the pay-per-viewers actually get to view what they paid for uninterrupted. If that’s the case, I genuinely applaud the WFTDA for striving to improve broadcast quality for their customers. But I wonder if that’s worth potentially shutting out a lot more people, or forcing their customers to pay to watch live roller derby that can, at times, be absolutely terrible. Tied into this is the second, much bigger unknown heading into the playoffs: The other playoffs. As is well-known by now, the roller derby arm of USA Roller Sports (USARS) is hosting its inaugural national roller derby tournament this year, played under its alternative rule set. Although the number of participants they have convinced to participate is much smaller—16 teams, compared to 40 in the WFTDA—they have scored two major coups that will make it interesting to follow. The 2009 WFTDA Champion Oly Rollers have announced their participation in the USARS tournament, meaning they’ll be pulling double-duty over the next few weeks. As well, DNN has indicated that they will be streaming two (of four) regional tournaments—for free—so everyone who doesn’t want to pay for–or can’t afford–the WFTDA stream will still have some live derby to watch on the weekends. So as the WFTDA community tries to get through one last major tournament with outdated consensus rules, USARS will try to get through its first with unproven progressive ones. But just like there’s a chance that the WFTDA tournaments may be good, or they may be bad, the USARS tourneys may be one or the other (or both), too. If the WFTDA misses and USARS hits, there’s an outside chance that people will start taking a more serious look at alternative derby rules, depending on what the WFTDA fixes (or doesn’t fix) with its forthcoming rules update. Like many other things this playoff season, that’s a big unknown. We’ll have a comprehensive USARS playoff preview next week. But this preview is about the WFTDA and the 40 teams that have qualified for the WFTDA playoffs. Let’s take a quick look at these teams and their realistic chances of making an impact on their region and beyond. Without question, the most impressive team in the regional top-10 is Ohio. Holy crap, Ohio. All they did was set a WFTDA record with a 20-1 regular season record, including winning their last 14 straight since late April. That’s 21 games in 28 weeks since their interleague schedule started in February, and 15 of those have been against opponents ranked in the North Central top 20—the 16th will come against Detroit outside of the playoffs next month. (Their only loss was versus #E8 Carolina.) One of those victories was, strangely, a 53-point upset in March against Arch Rival, who is seeded directly ahead of them. This is where things get really wild: #N5 Ohio beat #N4 Arch Rival. Arch Rival beat #N3 Naptown, Naptown damn near knocked off #N1 Windy City in the regional semifinals last year. And of course, Windy City famously tied against #N2 Minnesota. Therefore, through the powers of triangulation (which should never be questioned due to its astounding accuracy) we can determine that Ohio is clearly the best team in the region, and will have no problem advancing through to the finals. But seriously, it seems as if everyone in the top 5 has a legit shot to make it into the top 3. Windy City and Minnesota appear to be reasonably safe in getting championship berths, but there’s enough quality in the top end of the bracket to make it uncertain if they’ll get there as the #1 and #2 seeds. If their last meeting is any indication, Naptown and Arch Rival may very be equal, but then you’d also have to include Ohio in that conversation owing to previous results in the region this year. The thing that everyone is looking forward to in the first regional tournament of the season is the fact that most of these teams (certainly the top two teams) rely little on non-skating, pack-splitting strategies that everyone hates to watch. As well, all the participants are relatively close together in terms of team abilities, so blowouts may be limited. On the surface, then, the North Central may offer viewers the most bang for the buck in being the most entertaining to watch from start to finish. But in practice, with a lot more on the line during the playoffs then in the regular season, will we see teams start to abandon the FYGPM derby principles and start playing bad derby instead? Will some of the best derby begin to turn into some of the worst derby, all for the sake of going for the win above all else? It’s a great unknown. What is known is that the North Central on the whole this year is stronger than it has ever been, if recent results against the West are any indication. We’ll know by this time next week who gets to march to Atlanta with the region’s top seed, and the all-important championships first-round bye that comes with it. 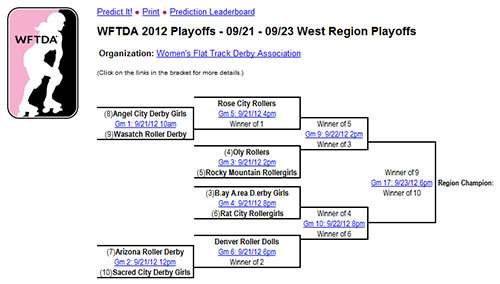 Once again, all eyes will be on the West to see what will happen in self-declared “best” region in the WFTDA. But unlike last year, where Rocky Mountain and Oly were easy picks to make it to the regional finals, due to roster shakeups—and not just the obvious roster shakeups—trying to figure out which three will still be playing for something in Atlanta will have your Magic 8-Ball pleading for you to check back later. Let’s start with the a bit of significant roster news you may have not have heard of: Angel City has picked up some of their own transfers, though they didn’t fly in—they just drove in from across town. (Now former) L.A. Derby Dolls all-stars Mickispeedia and Cris Dobbins (neé Affliction) have given up the banked track (for good, I believe) to help their flat-track counterparts get out of the bottom four and shore up their place as a top-10 team in the region. This is a pretty significant turn of events, considering Dobbins was probably the Ri-ettes’ best all-around player. She almost immediately fit that bill in Angel City’s tourney warm up victory against Hockey Honey and her non-WFTDA San Diego RD team. Even though Wasatch beat Angel City earlier this year (and yet again, are somehow ranked behind them), if the new-look Angel City lives up to their potential it’ll be a short honeymoon for the tournament darlings. ACDG might even give Rose City a bit of a scare in the next round, should they get there. The next roster move of note is the big one—Hockey Honey, Joy Collision, and Atomatrix joining Psycho Babble, Ecko, and the rest of the loaded Oly roster to make what may very well be their final runs at WFTDA tournament glory. The “controversy” over this turn of events, in my opinion and in the opinion of some others, isn’t really one at all. But there will be some who will take this personally, feel bad for the Arizona team Joy and Atom (legally and totally within the rules) left at the last moment, and give AZRD their support and Oly their jeers. But consider this: AZRD in their current form could very well beat their opening round opponent, #W10 Sacred City. And even with Joy and Atom, it would be very unlikely for AZRD to beat a strong Denver team in their second-round game, having with them lost to an already-depleted Rocky Mountain earlier in the year. The reality is AZRD was never going to get to Championships in the first place, and although their placement may have improved in the consolation rounds with them it would be unfair to think the players they do have can’t take care of business in the games they have a chance of doing well in. Oly, on the other hand, was probably being undervalued a little bit due to their lack of in-region action against top teams. While they didn’t deserve a top-3 seed because of that, they were likely good enough to play like one even before The Three transferred in. But now that they’ve got the band back together, it’s going to be difficult to not pencil Oly in as getting one of the transfer spots, especially considering that (should they beat Rocky) they’ll be facing Rose City in the semis, a team they’ve never lost to. The last bit of roster news isn’t so much transferability, but the players Rose City and Denver have to work with coming in as the region’s top two seeds. A glance at Denver’s 306-77 blowout over Rose at Rollercon might lead you to believe that they are the team to beat, but Rose City was lacking three of their top jammers at the time. The consensus is that result is an outlier, a throw-away game where one of the teams wasn’t at full strength through no fault of their own. But I don’t see it that way. Whether it be through inability to travel, or injuries sustained, or an ineptitude for staying out of the penalty box, it’s further proof showing if you don’t have your best players on the track, you’re not going to win. In this regard, both teams have monkeys to get off their back: Denver, for having a habit of giving up HUGE point swings to their opponents, the most recent being the 66-3 run they let Rocky have near the end of a 165-149 victory; Rose, for their horrible opener at Championships last year, committing 50 minutes worth of penalties on their way to a 143-135 loss to Kansas City. So while both teams have been brilliant this season, until they can prove to everyone (and themselves) that they can bring it home when it counts, there’s every possibility one or both of them will stumble. Especially Denver, who might be playing hosts Bay Area in the semis for the golden ticket to Championships. I’ll talk about Rat City later. Will Carolina take care of things on its own end or will they need the Gramercy Refs to prevent ANOTHER DOUCHEland PR disaster? All this talk about how the “sausage pack” is making the game less and less fun to watch, and you’re hung up on one team refusing to play an unwinnable game? And, if it’s such an awful thing that they did, why are they still VOTED into the top-10? Why have WFTDA, a SKATER RUN organization not changed the tournament rules to prevent it happening again? Dutchland’s move last year was unpopular, but totally understandable. Sorry, mate, the skaters have spoken. and the fans have spoken as well, by the look of them posing as empty seats. I think we’ll see the sausage pack go down in this tournament. The need for the affected team’s blockers to be more effective has hit critical.